If you have seen one of these, or know something about it, give me a holler. Very stuck and needing a lot of TLC. 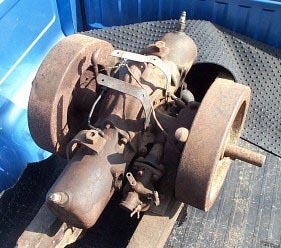 I have talked to several people about this one and the concensus is that it may be a rail car engine. 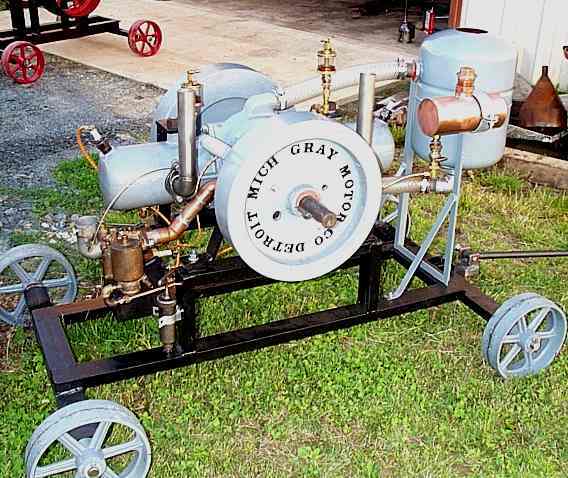 The flywheel on the right is inscribed with usual "Gray Motor Co." logo while the flywheel on the left is extra heavy with no inscription. The engine is actually suspended from the two brackets on the base of the cylinders. Getting out the pistons called for some elbow grease ! I machined blanking plates for the exhaust port and the bypass port out of some 1/2" alum. 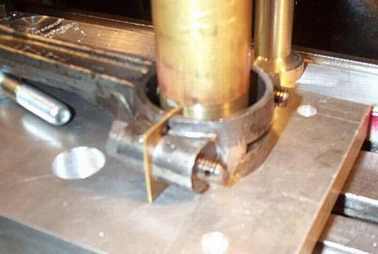 The bypass port plate was made on the mill using a boring head to make an arc with the same diameter as the piston. After that, getting out the piston was a breeze. There was about 3 lbs of grease used on each jug...pumping the grease gun was better than using a thighmaster. The rod bearings were shot...here is a jig to do both caps at once. The brass shims are 0.032. The center brass is 1.50". The final bored size will be 1.685" Since it is way undersize as poured, exact centering of the center post is not that critical. Babbit was poured. with molds preheated to ~350F . Small holes were filled with Fiberfrax to prevent babbit from leaking out. Pour temp was ~820F. After cooling, the center was removed and the excess babbit was removed with a coarse file. A 0.032" shim pack was installed on each side of the cap. 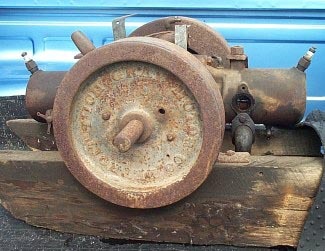 The rod has locating holes in the left side to keep the bearing shell from turning. Fixture I made to bore the bearings. The post on the right is scrap aluminum screwed to a aluminum base. 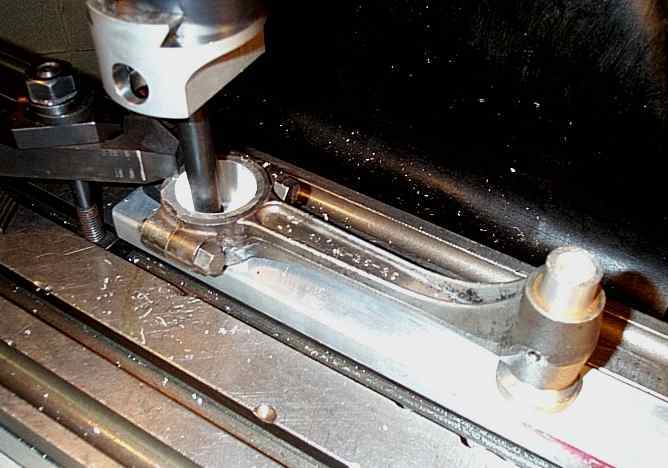 This ensures the bore of the main bearing is parallel to the wrist pin bearing. Downfeed was 0.003"/rev. Finished rods. Corners were beveled for radius in crank with scraper. Oil grooved cut with Dremel using 1/16 burr. Note the old bearing shells which were very egg-shaped. This whole job took ~10 hours; half of which was making spent making the fixtures to do the pouring and boring. June 6, 2001; Finished ! I started it up for the first time tonight and it sounds neat... Steady bleat, bleat, bleat from both cylinders firing at the same time. Had to switch from a Tillotson carb to a nice Wheeler-Schebler (Ford A model) to get it running and it kicked right off!! Lots of fabrication to get it mounted but worth every minute. 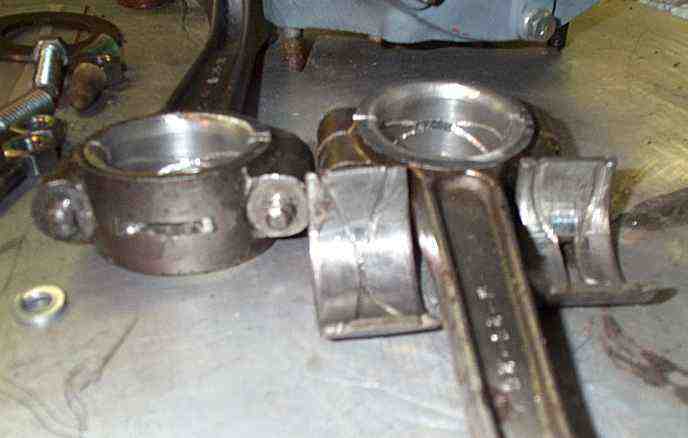 Check out those TIG-welded stainless exhaust elbows I made in my shop. The grease gun is for Alemite fittings on the mains.